The Bitter Twins is a new project from Anders 'Boba Fett' Lindstrom (ex-Hellacopters) and singer Sulo (The Diamond Dogs) in celebration of 20 years playing together. With these to heavyweights together you know what to expect, and those expectations will run high. For the most part, Global Panic will not disappoint. This short, 10 song, disc draws heavily upon both artists' extensive influences and musical history. 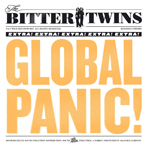 Global Panic delivers zesty and catchy punk driven melodic Scandi garage rock producing a power pop circa the 1980's where The Clash meets Elvis Costello. Global Panic moves with enthusiastic fervor and brightness from front to back. There's a certain amount of raucousness among the songs, but certainly on both Riot Club and Right This Time with their noisy vocal arrangements and pitched 80's punk feel. The latter song, Right This Time, and the long Rock Solid Core are typical of pieces drawing upon reggae and ska influences for a more lively and danceable delivery. Horns are brought in early on Global Panic finding their way into most songs. They're quite influential on Don't Hold Back and Right This Time. On a more intangible note, Liberation Avenue (possibly the finest track) found me imagining what a Springsteen and Clash collaboration might sound like. Fans missing Hellacopters and loving The Diamond Dogs will dig this collaboration between Lindstrom and Sulo. Global Panic finds both musicians excelling on this ambitious and infectious project.